Is it possible to kill a large area of weeds organically/naturally? We've got a ~4500sq/ft back yard that's probably 90% weeds. Is there an organic/natural way to kill off all the weeds so we can start from scratch? With kids and dogs and a swimming pool right beside the area, I'd really rather not spray a ton of roundup (or something comparable). I had one guy suggest Iron X but I've read mixed reviews. I've always read about people putting newspaper or black tarp over areas of weed to kill them, but with this square footage I'm just not sure that's feasible. Well, I might argue that a tarp IS adequate. It is far better than a lot of chemicals, especially with kids & a dog. Buy one large tarp. You can easily buy a 30x40 foot tarp for under $100. I saw one on Amazon for $59. You would probably spend that much money on chemicals anyway. 30x40 feet is 1200 square feet, or 1/4 of the square footage of your yard. So kill off one rectangle of weeds. This will take a few weeks. Then move the tarp to a new spot. After 4 placements of the tarp, the entire lawn is done. Clean up any small spots in the corners with a hoe. And, if you look around, you might be able to find a larger tarp. I did just look, and I found a silver/black poly tarp for $65 that was 30x50 feet, so 1/3 of the footage of your lawn. This is a little strange, but I'll throw it out here anyways. Around here there is actually a company that rents out goats to clean up large areas of unwanted vegetation. They come out with some hungry goats, the goats eat all the weeds right down to the ground, then they leave with the goats. Not sure if there is anything similar in your area, but might be worth checking into. Vinegar works pretty well. Spray down, and within a few days they should be dead. I'd follow it up after a few days with a rototiller, rake, and seed. Something not suggested: sheet mulching for "lasagna" gardening. A local department store will probably give you 4,500 sqft of cardboard boxes for free -- they may even deliver them! De-tape and de-staple them, break them down, and put them over everything you want to kill. Put a bit of topsoil on the cardboard to hold it down. The cardboard will eventually break down, enriching your soil. Please don't use RoundUp. Despite claims here and in Monsanto's marketing literature, it is deadly poison to numerous things -- including people. In India, an epidemic of farmer suicides is coming from drinking RoundUp in protest over Monsanto's grip on their seed supply. A non-toxic way of killing off a patch would be to cover the area in a black, light-proof tarp. The heat, combined with the lack of light and moisture, should kill anything under it. Edit: Oops, missed the "4500 sq ft" part. You might be able to find some rolls of inexpensive material, like plastic wrap or roofing cover, but that's still a lot of material. I had the same problem in our yard - 80% weeds, but wanted to avoid chemicals b/c of kids and dogs. Our yard was much smaller (less than 1000 sq/ft), but the solution worked well: I rented a gas-powered sod cutter, set it for a fairly deep setting and cut off the entire layer of grass/weeds. It's pretty hard work (especially hauling the sods pieces away). This method avoids pushing weed seeds farther into the ground as would happen if you just roto-tilled. After cutting the sod, I tilled and then planted grass seed. As noted in my comment above, those are strawberries. Think about preserving a patch. Roundup is not a bad idea, unless you live near a swamp/waterway, as it is toxic to amphibians. I'd just spray, and go visit the parents for a weekend. Other than that, your best bet is to roto-till and pull up as many roots as possible by hand, and then re-sod. You can build your own torch (um, dangerous) or purchase one such as the Red Dragon. But beware. According to this worthwhile read at Bifurcated Carrots, you should not use a torch near dry brush or over mulch, both of which can be extremely flammable. Also, a torch may not kill weeds that have matured past the cotyledon stage. You could kill the weeds with any of the other solutions already posted here, but if you don't cure the root cause as to why the weeds are outcompeting the lawn grass, they will just come back. Before you kill the weeds, get your soil tested. At the very least, check the pH. When the weeds are dead, spread lime as recommended by the pH test. Spread at least 1/2" of compost (1" would be better). That's about 7 cubic yards -- get it delivered (or make a couple trips with your pickup truck) in bulk, don't try to buy bags from the local big box! This will feed your lawn. It's worth investing in quality compost: free composted horse manure, for example, may be loaded with weed seeds. Municipal compost, if available in your area, probably won't have this problem. Seed your lawn. 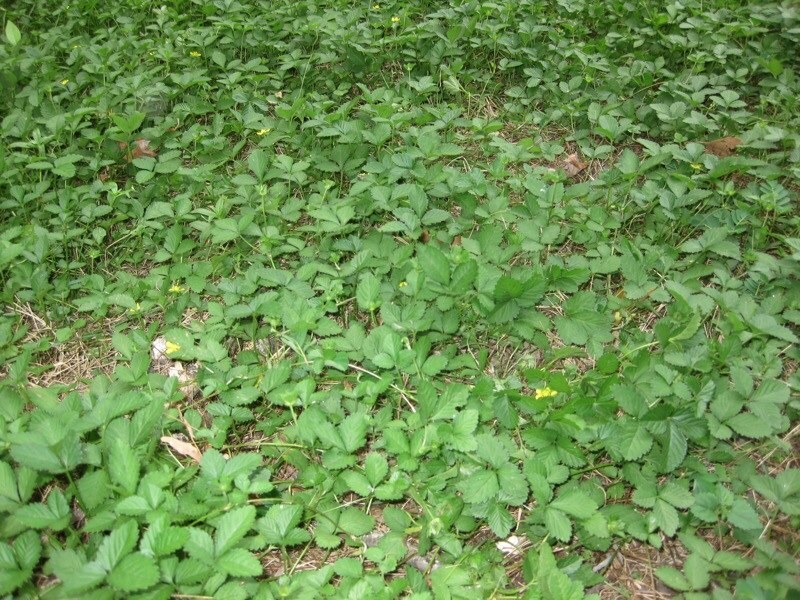 If allowed by your HOA, consider using a lawn seed mix that contains white clover. Clover draws nitrogen from the air and puts it into the soil; this helps to feed the grasses. Follow the tips in this answer for ongoing lawn maintenance. If you keep your grass healthy it will outcompete the weeds and you won't have this problem again. Further to the suggestion of goats, I had a large patch of Spiderwort (Tradescantia fluminensis) which was taken care of by two young hens within a couple of weeks. You could try the chicken tractor method or just let them roam around. With the Spiderwort the chickens were quite interested in eating it and it has hardly come back at all this warm season (in Australia) leaving a few small plants which I could easily remove by hand. The only thing I would mention is to do some research to make sure the weed you have there is not toxic to animals. Re RoundUp - don't use Round up, if you must use a weedkiller, buy glyphosate. This is the active ingredient in Round Up, minus all the other additives they put in it which make it more of a threat to the environment. Glyphosate works just as well - if you want to add a surfactant, a squirt of washing up liquid will do the job. Note that Round Up once contained the slogan 'bio degradable, environmentally friendly'. This labelling was removed some while back when these claims were proved to be false. Black plastic or tarpaulins, if you want to go that route, must be anchored tightly to the ground to exclude, air, sunlight, and water, and should be left in place for a year to achieve good results. You could cover most of the area with those, and then use the most eco friendly solution of all - digging, with a fork, extracting all the roots, a patch at a time, just whatever you can handle. Any organic gardener will tell you Round Up damages the ground. It will cause resulting weed problems that last for years. It's also not organic. A rototiller won't be of any help. It's better not to disturb the ground. Once the weeds are killed some other way a rototiller will just stir things up. If you use a rototiller when you still have weeds, it will just break them into tiny pieces that will regrow and make a mess. A weed burner won't kill established weeds. This is a reasonable area to use black plastic on. I suggest not thinking about it as an area you will transform overnight, but rather over a few years. You could think about covering a quarter of it at a time, then you don't need to buy so much plastic. The best plastic to use is woven landscape plastic, that will let through water and air. Unwoven plastic will kill all life in the ground, and it will take time to recover from this. Also unwoven plastic will stick and become a mess if you leave it too long. Black plastic takes about 6 months to completely kill weeds, not just a few weeks like someone said above. A nice, organic and renewable way to kill the weeds is with wood chips or bark. You'll need a lot, it'll have to be delivered by truck. It'll be a little pricey. You'll need about 80 yards. You'll want an initial layer about 6 inches or thicker. As it kills the weeds it'll rot, feed the ground and get thinner. You can rake holes in it to put plants, or move it from one side of the yard to the other to maintain thickness. After about 2 years it'll mostly be gone, and you'll be left with rich weed free ground. When you get tired of the bark, you can rake it into a compost pile. Newspaper works also: put down some newspaper, spread mulch on top, wait a bit and rototill it all in. Newspaper ink is soy based now so it's fine; prepare the soil and plant. I had a backyard that was all weeds. Before I was educated on weed killers ( 10 yrs ago)I sprayed the yard. It killed everything. The weeds came. Back after a couple of weeks before I had a chance to do anything. I did it again. The weeds didn't resurface. I didn't till ( this would bring more seeds to the top) I users dethatcher and removed everything. I put sod down and haven't had a problem with the weeds. Round up is only active when absorbed by the plant. Once it hits the dirt it becomes inactive. You might try the tarps. Then lwhatever germinate use the round up as soon as you see the sprouts. I beleave in laying sod. See if your area has a master gardener program and call them shouts the round up. I would suggest Avenger weed killer. It's an organic (citrus oil) post-emergent herbicide. It works pretty well mixed at strongest ratio the day before and then sprayed on a hot day right before the sun hits the area. It is very fast and effective, with results two hours later. I have used it for clients for blackberries and it turns them brown in 2 hours. It does not work well on cape ivy. I think it's best in sunny locations. A good non toxic herbicide is Round-up. Although it is not strictly organic, it is non toxic. It is systemic and works in less than 7 days usually. The refuse can be tilled in with no damage to new plantings. You will need to rototill or York rake the area before replanting grass. Not the answer you're looking for? Browse other questions tagged weed-control organic or ask your own question. What's an organic way to discourage crabgrass from a large “lawn”? How long before poisons like Round-up become inert? Are clear or opaque tarps better for solarization? How do I prepare and sow a lawn organically? Natural herbicide to kill weeds in a hard landscape environment? How large a cultivation area to feed one person? How do I kill couch grass organically prior to sowing a lawn? How quickly can I kill weeds by covering them? How do I fix the worst lawn on the street? What is the Most Effective Ground Cover For a Large Area? How do I eliminate weeds in established play area? Boiling water to kill weeds?